On November 2nd, it was announced that Crypton Future Media’s CEO, Hiroyuki Ito, was selected to receive the Blue Ribbon Medal of Honor from the Japanese government, making it the 16th Blue Ribbon medal awarded in 132 years. The medal is awarded to “individuals who have made significant achievements in the areas of public welfare or public service”. 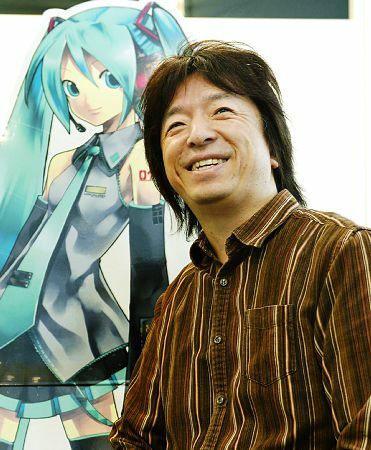 Crypton was recognized for the creation of Hatsune Miku, who is now widely considered to be the world’s most-recognized Japanese idol. She helped spark a creative boom that has resulted in a nearly endless amount of derivative works, and allows creative freedoms in a time where media copyrights are becoming more restrictive. Upon news of the award, Ito commented that it felt odd that a younger person such as himself is now suddenly grouped in with other older and distinguished individuals. More here (Japanese only). Details of the Snow Miku Sapporo event as well as dates have finally been announced. The first stage of the event is the unveiling of the new Snow Miku tram car, which will be active in Sapporo City between November 18th 2013, and March 28th 2014. The only preview we have so far is the pixelated image below, showing that this year’s tram car will be colored purple. Visitors will be allowed to preview the completed car a day early on November 17th, and even take pictures (no photography will be allowed inside the car during the operating period). It was also revealed that you can hear Fujita Saki, the voice provider for Hatsune Miku’s software, making special special announcements inside the tram car during operation. The operation schedule can be found from Sapporo City’s homepage, and updates to the Snow Miku event can be found from the official page: SnowMiku.com. The main Snow Miku Sapporo event is scheduled to run between February 5th and 11th 2014, but further details have yet to be announced. Today was the 9th anniversary of the release of Meiko’s software, and Crypton decided to use this day to reveal new information about Meiko’s V3 software update, as well as open up preorders (Japan only for now). It has been announced that Meiko’s V3 software will include 5 vocal styles: Power, Straight (original), Dark, Whisper and English (this one was a surprise). The planned launch period is sometime in the first quater of 2014. The first demo song titled “逆襲のMEIKO” was composed by BingoBongoP, and used the Power vocal style. The second demo is titled “A Certain Night“, and was composed by ゴゼンP using the Straight and Power voice styles. Crypton is also holding an anniversary celebration on Karent with several new albums featuring Meiko, as well as a wallpaper download. So go check it out. SEGA didn’t want to miss out either, and is offering two wallpapers for download: A Project Mirai 2nd themed wallpaper, and one based on Project Diva Arcade: Future Tone. You can grab both from their official blog post.